I could never claim that I'm an expert in Indian food, in fact it's a type of cuisine that I've only recently started to enjoy. For years I avoided it, worried about my nut allergy and inability to eat anything spicy. It's only been in the last year that I've learnt that there's far more to Indian food than Vindaloos and Chicken Tikka Masala. So I'm slowly working my way round all of the best Indian restaurants in Newcastle and my latest adventure took me to Sachins, one of the most popular in the Toon. Sachins specialises in Punjabi cuisine and are well known for their delicate use of herbs and spices sourcing only the best ingredients. Having made their home in Newcastle over 30 years ago, Sachins is very popular with fans of Indian cuisine in the city so it was definitely time for me to head to their restaurant on the historic Forth Banks and discover if they truly are the best Indian restaurant in Newcastle. 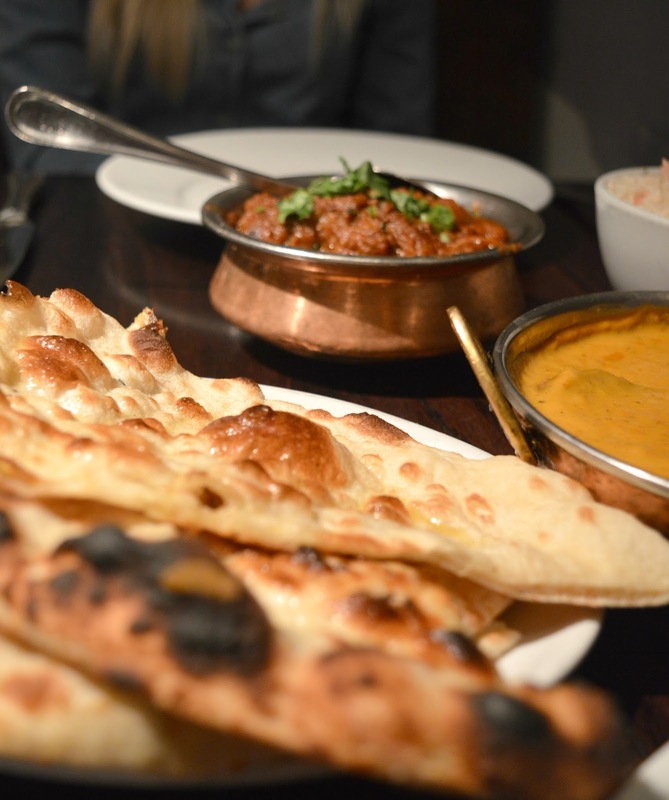 I've come to learn that enjoying Indian food is all about finding truly great restaurants with expert chefs who use traditional cooking methods and fresh ingredients and Head Chef, Bob Arora, certainly knows a thing or two about preparing delicious dishes. 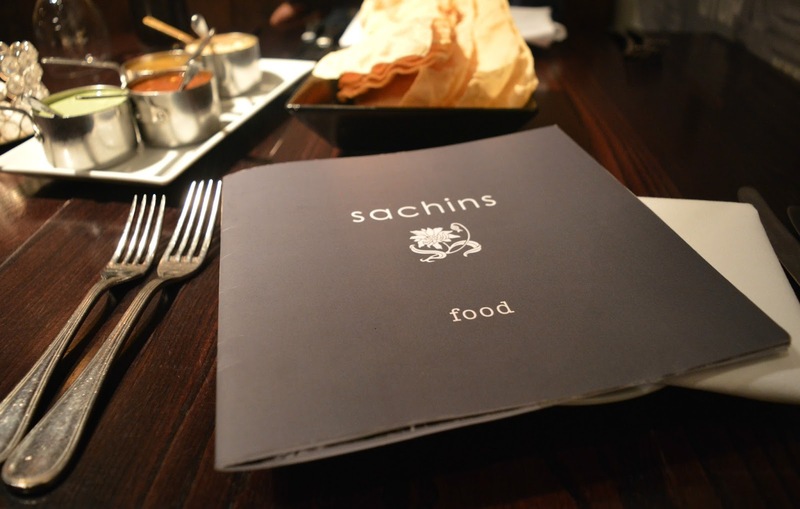 There are two type of menus to choose from at Sachins, the a la carte from £8.95 and set menus from £45.00 for two. We decided to choose from the a la carte which was a perfect sized menu with plenty of dishes to choose from without being overwhelming. The menu is easily split into different type of meat, vegetable, rice and breads which makes navigating it effortless - a "must" for someone like me who finds it so hard to make menu choices! With each dish clearly marked for dietary requirements I felt instantly relaxed about my nut allergy and the notes on spice levels was also very welcome. Our evening began with a mountain of poppadoms (95p) with a fully loaded pickle tray, perfect for absentmindedly chomping our way through whilst having a gossip and perusing the menu. It's crazy how easy it is to munch your way through poppadoms without realising how many you've had. They are so moreish. Although everything in the menu is clearly marked I made sure to double check with the waiter that I was able to order what I wanted and he was great at reassuring me and even recommended some dishes that could be customised to meet my dietary requirements. I love being able to relax when I'm eating out knowing that I have nothing to worry about. 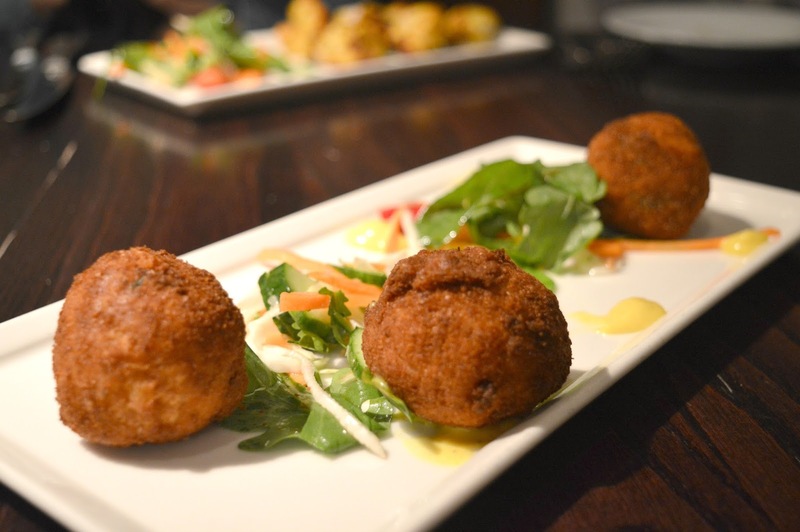 For my starter I decided to start with a seafood dish and ordered the Salmon Kofta (£7.95) - delicately spiced salmon and potato koftas coated in breadcrumbs, shallow fried and served on a bed of salad. It was the perfectly sized starter and it was so delicious it was gone in seconds! 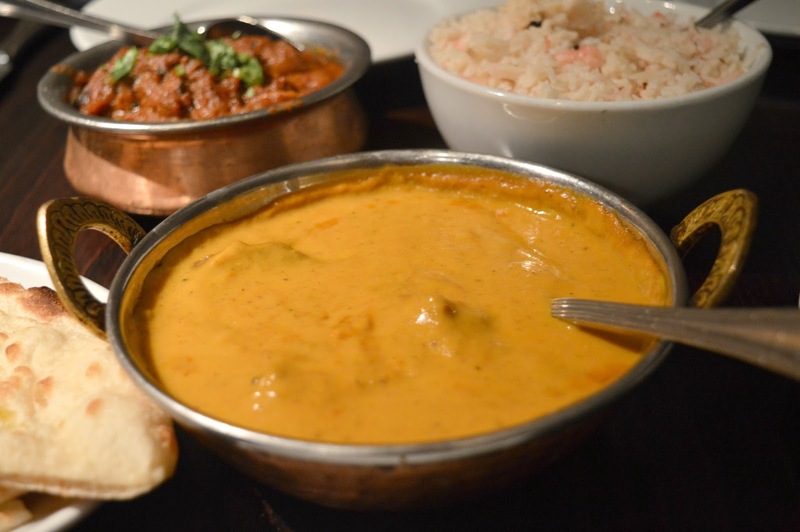 Most dishes at Sachins are served medium level spice or above but some dishes can be prepared with milder spices so it's worth asking if you aren't too keen on hot dishes. That said, I decided to go for a medium spice dish and found it the perfect level for me - I'm feeling very proud of myself for having got a little braver in my spice journey! 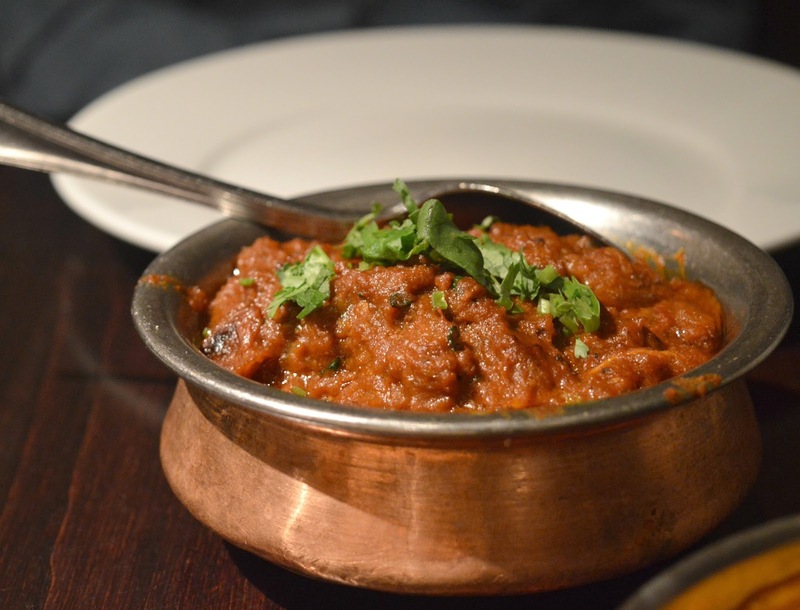 I opted for the Lamb Pasanda (£11.95) - diced lamb cooked with mango and cream. I can easily say that in my great adventure to discover my favourite Indian dishes, this one has been my favourite so far. It was so beautifully creamy and the flavours really hit the spot. I literally wanted to tip the bowl upside down and drink the left over sauce, it seemed a shame to leave it! Talking of bowls - how amazing are these dishes? I loved how the food was presented at Sachins. I'm never sure how much food to get when it comes to ordering sides but sharing the two dishes was the perfect amount of food with our mains and left us feeling pleasantly plump without being overly stuffed. We both agreed that the Naan was particularly amazing and like nothing we'd had before. The bread was so light and packed with flavour - I could have happily eaten a huge stack of them as a completely separate course! So what was the verdict? 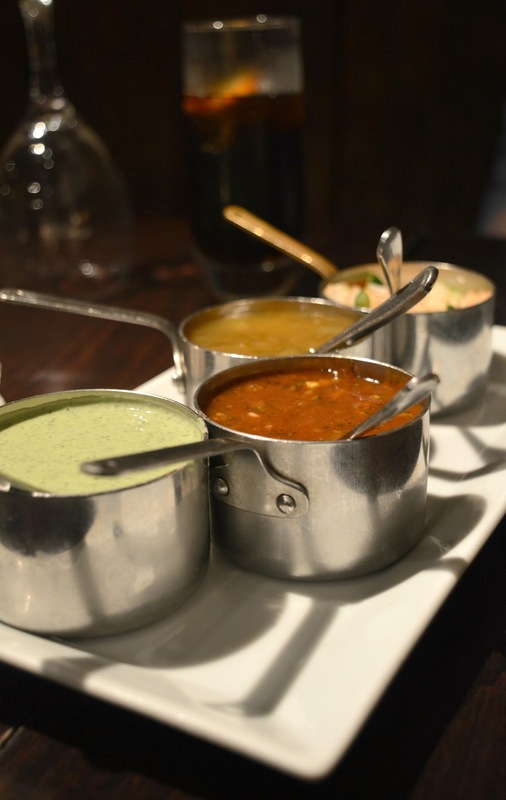 Is Sachins the best Indian restaurant in Newcastle? I think it might be! The food was fantastic with the most delicious flavours and I can't wait to tell everyone I know what a delicious dinner we had! Have you ever been to Sachins? I need to know what to order on my next visit! We were invited to Sachins for a complimentary meal for the purposes of this review. All thoughts and opinions are our own. Oh it looks gorgeous! We've never been but it's definitely on our list of places to try as it has such a good reputation. I was eyeing up their Christmas menu yesterday and it looked to be very good value! I’ve heard great things about Sacchins from friends and have been meaning to go for YEARS. You’ve convinced me I need to finally put that into action. I too am a wuss with spice! Not just the best in Newcastle, I've travelled the world and nowhere comes any where near. not one thing on the menu disappoints,and the service is always first class... its our favourite place to go! !